Drivers passing through Indian Wells normally encounter a monotonous stretch of lawns, sidewalks and opulence. Now, though, travelers are sighting a colorful, quirky object on the horizon. It’s the old Carl Bray gallery sign, recently replanted by the City. 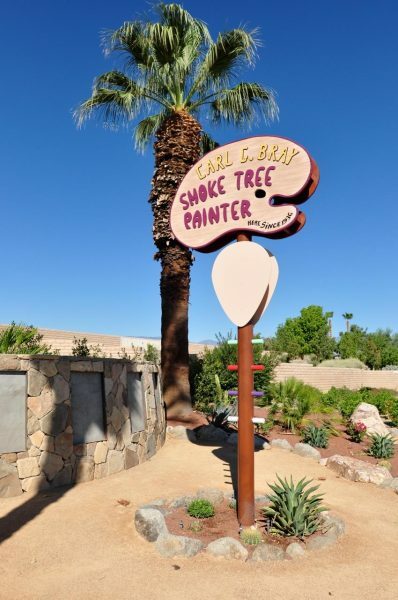 The resurrection of the palette-shaped Smoke Tree Painter sign is a testament to the tenacity of the Indian Wells Historic Preservation Foundation. The group, led by Adele Ruxton, kept nudging the City for the last five years to see the project through. Preservationists all over the Valley lobbied to save Carl’s roadside gallery and home when it was threatened with demolition in 2010, but it was ultimately torn down anyway. Carl died in Banning the following year. As part of a mitigation agreement (by law, you have to make amends if you tear down an important place), the City was bound to construct a marker at the site. To the joy of all it’s finally taking shape. The sign is actually a replica, as the original was too weathered to stand beside the highway. The restored original will be displayed in the protected confines of City Hall. 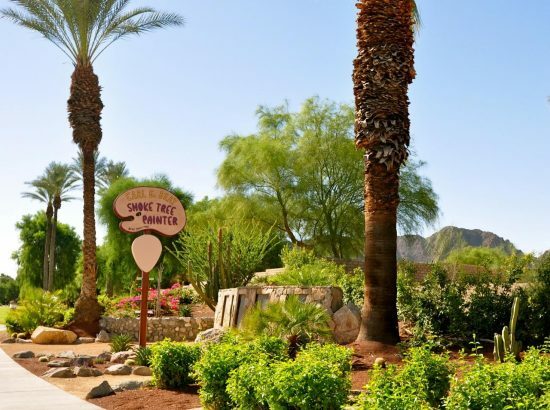 The five blank panels on the stone wall next to the roadside sign will hold text describing the history of Indian Wells, along with the story of Carl Bray and the Smoketree School of desert art. Watch for a dedication ceremony in the fall of 2015. Our recent article by Gary Fillmore on appraising desert art prompted more tips. One reader suggested going to websites like AskArt.com where you can look up auction prices for your artist and come up with a ballpark value. Some information on the site is free but there’s a fee for auction numbers. With a 24-hour subscription ($14.95) you can self-appraise the stack of paintings in the hall closet. 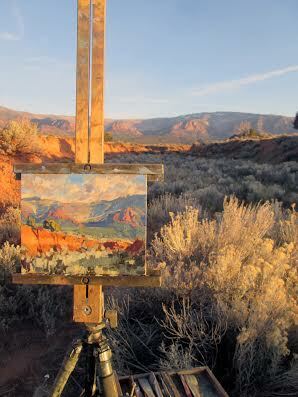 Wasserkrug describes himself as “an art enthusiast who collects way more than I ever sell.” Feel free to contact him with your square-inch questions about California and desert paintings. Kay Levie, director of the stylish and happening Borrego Art Institute, introduces our mystery artist of the month. 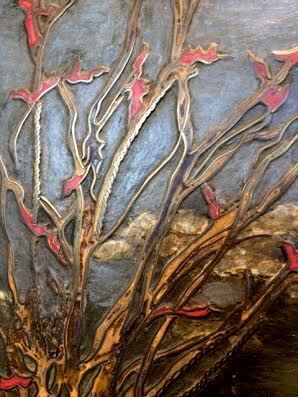 David Villasenor was a well-known sand painter who at one time lived in Glendora and showed his work at the Desert Magazine Art Gallery in Palm Desert. Born in Mexico, he learned the sand-painting art among the Navajos in Santa Fe. 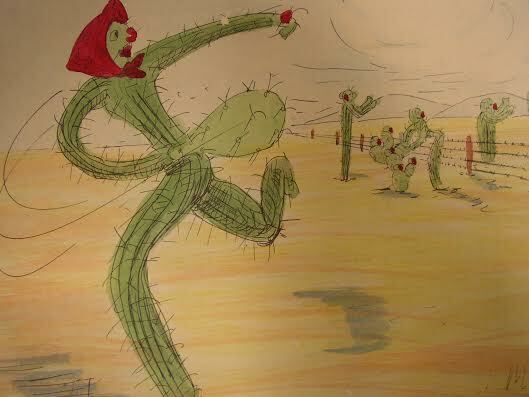 Neal Gray recently came across two intriguing sketches by Villasenor, from a series of 21 cartoon-style illustrations called Cactus Capers. The sketches–Fancy Tennis and Mowing Them Down–are dated 1939. The Cactus Capers series appears to have been linked to a book or magazine project, but the story behind them is lost. Does anyone know the story behind Fancy Tennis, Mowing Them Down and the other 19 mystery capers? The sketches are for sale at Neal’s shop in Moorcroft, Wyoming. To reach Neal Gray call (406) 794-8393 or write dee@giftsthrifts.com. Ann, here is a website where you can get auction prices for artists with NO FEE. Drawback you just get the paintings name, when it was auctioned and for how much. You have to join to get more info. Still it is a beginning when trying to see what a painting is worth.